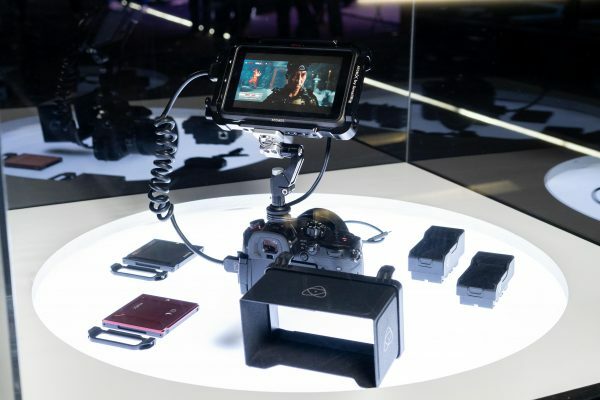 The Atomos Ninja V is almost ready to start shipping and Atomos says that they will start delivering orders by the end of this month. The company showed us the first add-on units that will make use of the Ninja V’s AtomX expansion port, which is bi-directional and allows I/O of video, audio and power. 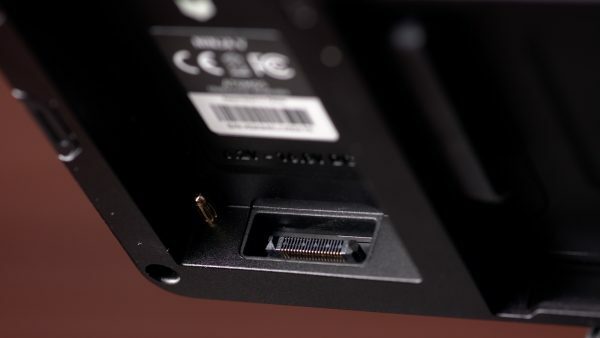 The expansion port is something we haven’t really seen on a monitor/recorder before and looks a good way of adding functionality selectively, so you’re not paying for features you don’t want. Erik did a first look video of the Ninja V last week and he was impressed with the brightness of the screen and the more simplified menu system. Atomos are still tinkering with the UI and it may be slightly different from the unit we first saw. The first two AtomX modules are the AtomX Ethernet/NDI and the AtomX Sync. 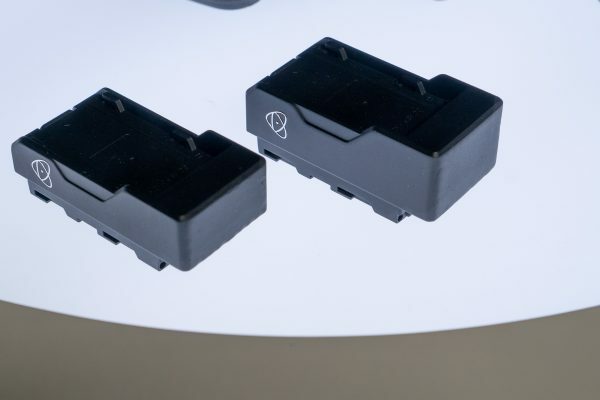 These dock into the AtomX port and add NDI over ethernet, or wireless sync and Bluetooth control to the Ninja V.
The AtomX port on the Ninja V is underneath the battery port and allows power pass-through as well as data. Atomos have partnered with Newtek for the AtomX Ethernet and Timecode Systems for the AtomX Sync – this means that the AtomX Ethernet will appear as a node on Newtek NDI networks, and the AtomX Sync will allow you to sync timecode with other Timecode Systems gear. The AtomX Sync records embedded timecode directly into the ProRes or Avid DnXHD file in the Ninja V. That means the timecode metadata can be read by any NLE – there’s no need for an external sync box or genlock. 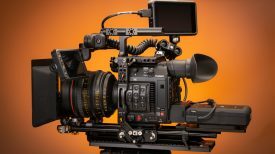 The Ninja V with the AtomX Sync looks to be a very affordable way of getting timecode sync between multiple Ninja Vs or Ninja Vs and other cameras, as well as when recording sound separately. If you want to sync a non-Ninja V camera with a Ninja V you can do so by attaching a Timecode Systems box to the camera in the way you would normally. 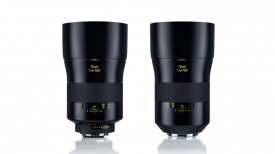 The sync is shared between any Timecode Systems product wirelessly (such as an Ultrasync ONE) and Atomos claim the system has a range of 300m (984ft). 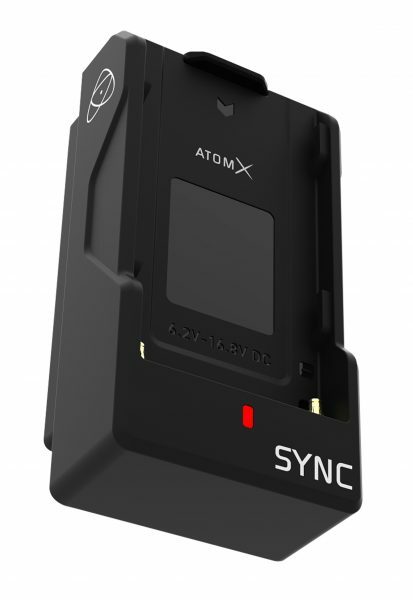 The AtomX Sync also has a built-in battery extender that allows for continuous power when swapping batteries, ensuring uninterrupted operation of the Ninja V during a shoot. 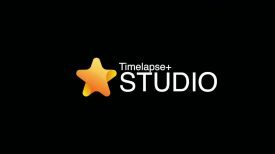 Timecode Systems make an iOS app that you can use to control and monitor multiple Ultrasync ONE units – so it wouldn’t be a huge surprise to see a similar app made available for the Atomos V when using the AtomX Sync. The AtomX Ethernet/NDI module has a wired Gigabit ethernet connector that delivers live video over IP networks. Newtek’s NDI technology allows for control of multi-camera networks, replacing traditional SDI cabling. The AtomX Ethernet/NDI module has NDI input and output with encode, decode, control and sync, allowing Ninja V users to transmit, distribute or receive and monitor NDI from any NDI source. When you turn on the Ninja V with an AtomX Ethernet/NDI module installed and plug in your network cable, your source will be automatically discovered on the NDI network. 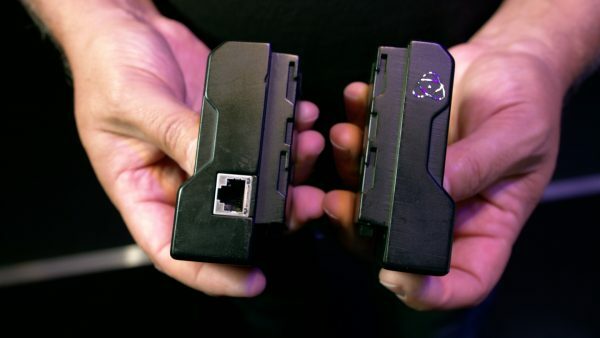 These are the first of many modules we could end up seeing for the Ninja V. It wouldn’t be a big surprise if we were to see an SDI AtomX module, and also wireless video, finding its way into the expansion slot. The AtomX Ethernet/NDI will sell for $199 US and the AtomX Sync for $149 US, but they won’t be available till later in the year.